Just about everyone has a smartphone these days and what’s one of the biggest draws to these phones? Internet use. If you have a website, there’s a very good chance your traffic is largely mobile users. In fact, in 2018, 52.2% of all Internet traffic was mobile based. That number is only increasing year after year, proving that mobile Internet functions certainly are the way of the future. With so many users using their phones to go online, making your design mobile friendly is imperative. Here are some strategies to make sure your site’s design is viable for mobile users. When buttons are too small on phone browsers, it’s an incredibly tedious experience for the user. If someone has to zoom in just to avoid clicking the wrong button, the design needs updating—and not just buttons either, but also fonts and images. For fonts, the ideal size is at least 14 pixels, making it easy for viewers to read your content without having to zoom in. For forms, captions, or labels, the font may have to be scaled back, but to no less than 12 pixels. Buttons, on the other hand, are recommended to be at least 40 by 40 pixels in order for users to easily tap them without zooming in. When adding images, it’s crucial to ensure that the asset in question scales correctly between portrait and landscape modes. To address multiple screen sizes and layouts, image adjustments may be needed, from photo editing to CSS styling. However, the importance of a properly scaled image can’t be overstated. While it’s sometimes tempting to fill a page with text, it’s not ideal for mobile users. Breaking up an outpouring of text with bullets, interactive buttons, or expandable menus not only helps with user engagement but also provides for a more accessible read. 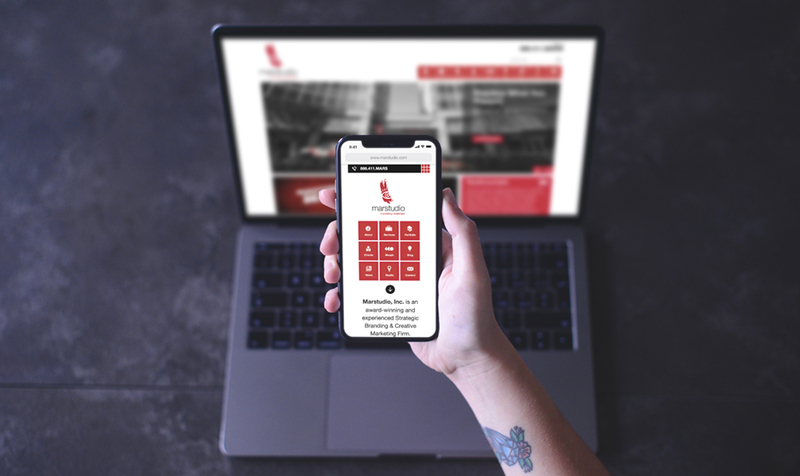 Unlike their desktop counterparts, mobile websites must be browsed with a finger rather than a mouse, so your content must adapt to that method of scrolling. Remember, with mobile designs, minimalism is ideal, and that certainly applies to text as well. Navigation menus are essential for any website, but even more so for mobile users who can’t pivot back and forth between pages as easily. Positioning the menu in the right place can be very strategic, encouraging users to explore your site for longer periods of time. User convenience is extremely important when designing your mobile site, and a good design can make or break the website. If your business has a website that isn’t properly adjusted for mobile users, Marstudio is happy to help. Call us today to set up a consultation to discuss all your website design and development needs.